2 Red sponge cakes filled with chocolate flavour sauce, topped with vanilla flavoured frosting and decorated with strawberry flavoured pearls. 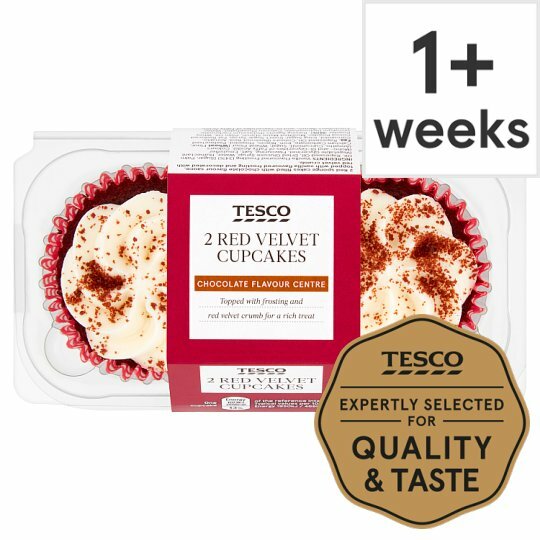 INGREDIENTS: Vanilla Flavoured Frosting (38%) [Sugar, Palm Oil, Rapeseed Oil, Dried Glucose Syrup, Water, Humectant (Vegetable Glycerine), Flavouring, Salt, Emulsifier (Mono- and Di-Glycerides of Fatty Acids), Colours (Annatto, Curcumin)], Sugar, Wheat Flour [Wheat Flour, Calcium Carbonate, Iron, Niacin, Thiamin], Pasteurised Egg, Rapeseed Oil, Colours (Beetroot Red, Annatto, Curcumin), Icing Sugar, Invert Sugar Syrup, Fat Reduced Cocoa Powder, Modified Maize Starch, Palm Oil, Water, Whey Powder (Milk), Raising Agents (Potassium Carbonate, Disodium Diphosphate, Calcium Phosphate), Emulsifiers (Mono- and Di-Glycerides of Fatty Acids, Polyglycerol Esters of Fatty Acids, Soya Lecithins, Polyglycerol Polyricinoleate), Preservatives (Potassium Sorbate, Calcium Propionate), Salt, Maize Starch, Glucose Syrup, Flavouring, Acidity Regulators (Potassium Hydroxide, Citric Acid), Stabiliser (Xanthan Gum), Strawberry Powder, Elderberry Concentrate. Suitable for home freezing. Ideally freeze on day of purchase but always by "best before" date shown.